Despite the winter chill approaching, had a great day with Willesden Green Town Team‘s Elayne, Deborah et al with a sumptious smattering of Transport For London colour co-ordinated cakes for sale (made by Daniel & Mashud of TFL). 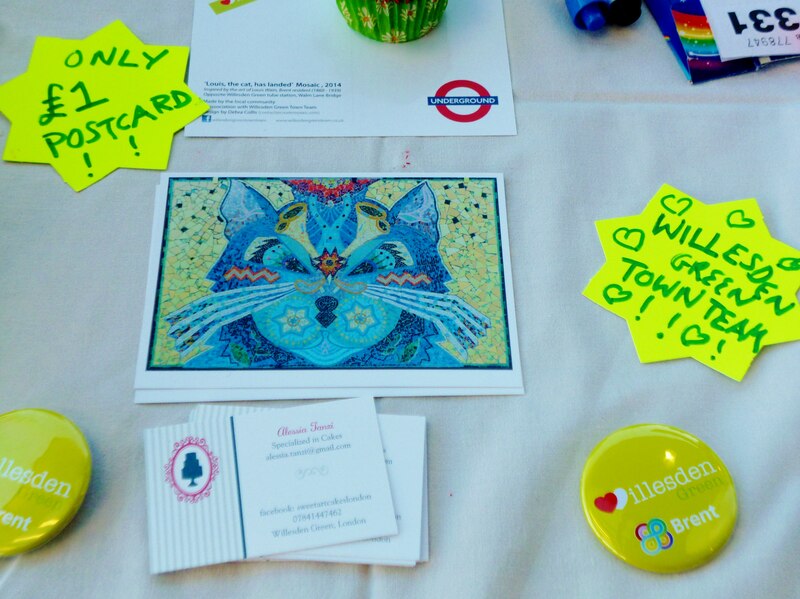 A few mosaic stars, and Louis, the cat mosaic, souvenir postcards were also available! Donations were sought for the WGTT and they raised quite a bit for future cakes (oops, I meant upcoming projects) for the local area! Oh, and there was this band Parralox too, not your average Xmas carolling, but kick started our party nonetheless! (with mulled wine – provided by MAPRA) and not forgetting the Wood burner stove that Pat brought from his garden so we wouldn’t catch our death of cold. Author beetruPosted on December 15, 2014 December 20, 2014 Categories UncategorizedLeave a comment on Baby, its cold outside! Louis, the cat, has landed! 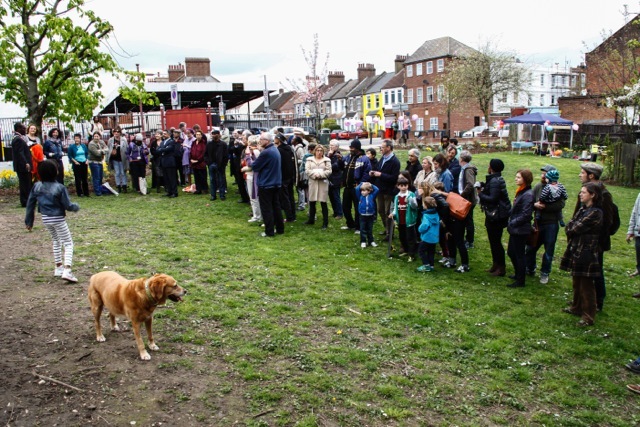 Last week was the launch of Louis, the cat mosaic – it was a great day alongside the WIllesden Green Town Team sumptious cakes and fund and awareness raising event at the tube station (Willesden Green). 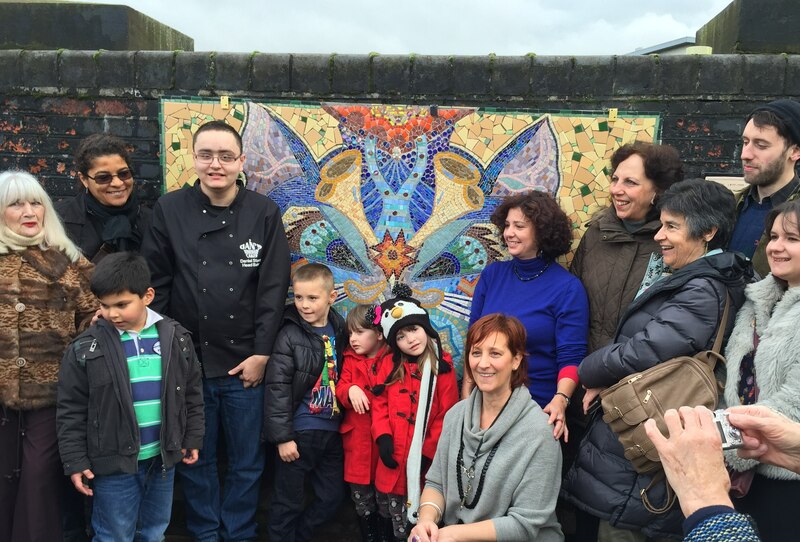 Lots of people who had worked on the mosaic came along on this very special morning, with some surprising sunny weather! Fernando Soler and John Doyle from Jubilee Line, Transport For London were also in attendance, making the speeches, and working the crowd! The cat was welcomed by the well wishers who came for the launch and to enjoy the wonderful spread of cakes which Deborah Mahs, chair of WGTT, managed to organise, to raise money and awareness for the Town Team’s future projects – children growing vegetables, shop locally, greening of willesden green and…. 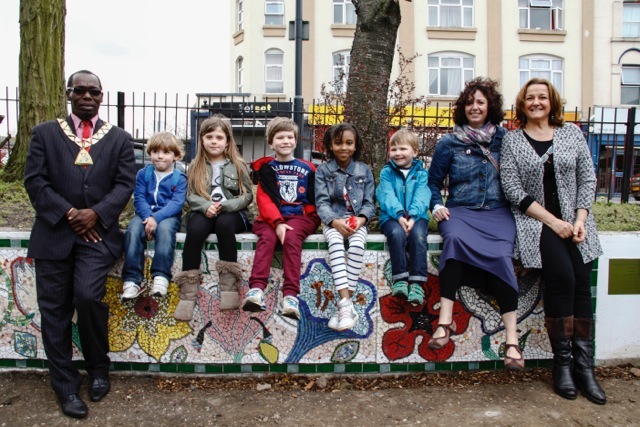 We are developing plans to continue the mosaic theme in WiIlesden Green with a Catwalk Mosaic throughout the town area linking areas from the tube to the bus station at the Dudden Hill side, with lots of small cats along the way on various walls and pavements. We have started a spacehive fund for general public to donate…. 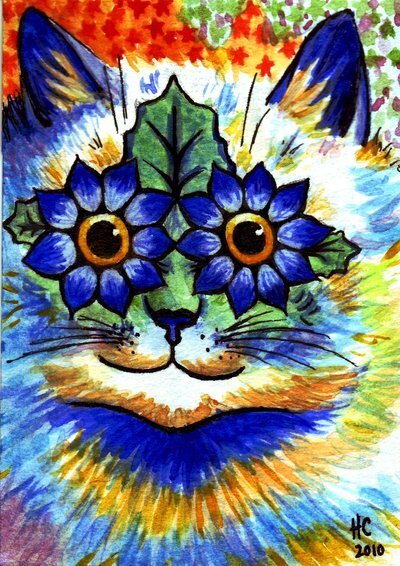 The inspiration for this project came from a postcard I glimpsed by Louis Wain, a now forgotten, but much loved and popular artist in the turn of the 20th century. His work became quite ‘kaleidscopic’ and vibrant in his later life (linked to mental instability, it has been claimed) but very inspiring, whimsical, and in my mind thought provoking about the fragile human mental condition. He was also a previous resident of the Willesden area. The catwalk can also be used as a metaphor to symbolise community spirit, as each cat will have a different character and outlook but can provide a visual link for bringing the local area together when visited along the high street. Author beetruPosted on December 15, 2014 December 15, 2014 Categories UncategorizedTags cat mosaic, Fernando Soler, Green Town Team, tube station, Willesden GreenLeave a comment on Louis, the cat, has landed! 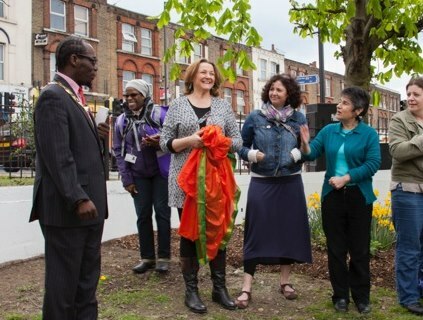 Images from launch party for mosaic mural on April 4th celebrating the 3 month culmination of creative work and endeavour by members of the community around Odessa and Palermo Rd, Kensal Green. 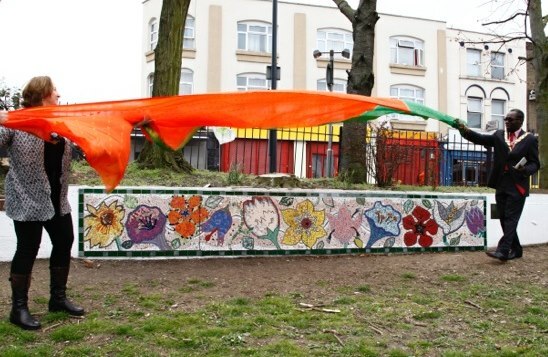 Mosaic was designed by Create Mosaic Workshops (Debra and Bea), intented to help brighten up the local park which was in desperate need of some TLC! Lots of attendees were at the party including the Mayor of Brent, local councillors supporting the Community led initiative, local residents who took part in the community workshops, Organisers (Carol, Nanda and Nathalie), Debra’s mum, Bea and her cakes, Michelle (the photographer) and her dog, drumming for all and a whole host of passersby. Mosaic used to great effect – seen last year in a pond area at Hannah Peschar Sculpture Garden, near Dorking in Surrey. Wonderful array of sculptures using all sorts of material, including mosaic medium! Came across this interesting article on CMA of a mosaic seen as I was sailing past on my trip to Venice last year.